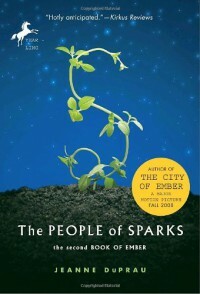 As with the last book, The City of Ember, I’m taking into account the audience this book is aimed at when making my rating. Why am I doing this now? Well, I believe I was far too harsh on the Master Magician review and far too critical, which is not what I want to do. I want to analyse and understand the book, and if you’re looking at the review and the genre, you’ll know if it’s right for you or not. We follow the same two main characters again in this story, Lina Mayfleet, and Doon Harrow. However, now things get a little interesting as they have escaped and their adventure has ended. So, we see the story, and the story lines split, and we experience two completely different internal struggles. About half-way through (or maybe a third), the stories split. In the first part, Lina is stuck with the doctor, with Mrs Murdo and Poppy (her sister). We also see a smaller role played by Torren Crane (a little boy who needs attention). Lina, as an adventurer, and never one to stay still explores the world and its wonder and dangers. She joins Caspar (Torren’s older brother) and Maddy and learns what it is to be a Rover. What she learns during this time, about the world and kindness and hatred, maybe makes her regret her decision. Doon’s character is still learning all the time and still wanting to figure things out. But, because he’s not a natural-born leader, someone more charismatic, and someone with worse intentions leads the people of Ember. His name is Tick Hassler, and the more we read into the story, the more we see his real personality shine through. Doon is blinded during the story by Tick’s ambition, but he soon realises what Tick is. The first idea I want to discuss is conflict and escalation, as that is the central theme DuPrau wanted to get across. We see this with the escalating situation between the people of Sparks (who own the village) and the people of Ember. What we see between the two peoples are differences and judgements. Both people think that they are more or less superior to the other and the differences are heightened. We also see a power struggle when the people of Sparks use their home advantage. The second theme I’d like to take into account is kindness. This is only a minor scene and subject, but it is shown with the relationship of Maddy and Lina. We see Maddy share her (small spoiler) food with Lina when Caspar wanted to throw Lina away. We see Maddy want to (spoiler) share her food with another Rover, but Caspar wouldn’t allow it. Then, the night after the food is stolen and spoilt. I like small scenes like these which show children the importance of being a good person. While not as good as The City of Ember (in my opinion), the book certainly has a lot of moral standing and can teach children a thing or two about the world. It’s not as playful as the last book, but it does show how people can work together to achieve great or bad things. Again, because of the writing, I would recommend this to younger children rather than young adults.